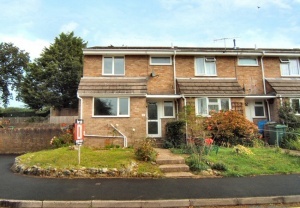 An attractive end of terrace family home in a quiet cul-de-sac in the centre of the village of Wroxall. There are only three other houses in the terrace. 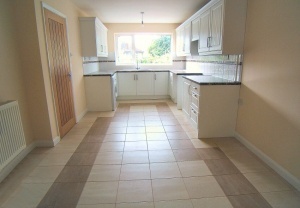 The refurbishment of this property has just been completed and includes a brand new kitchen, bathroom, rewiring, boiler, carpets and d閏or. 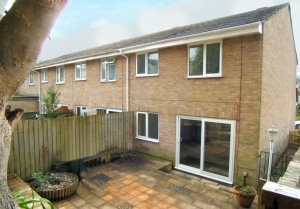 There is a large reception room on the ground floor with double patio doors to the pretty rear terraced garden. 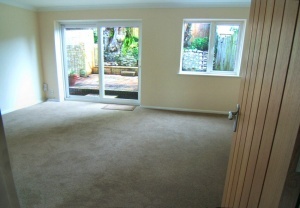 The reception room is open plan to the new kitchen with leafy views to the front. There is also a separate downstairs w.c. off the entrance hall. 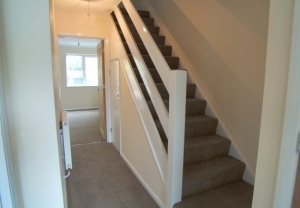 Upstairs are three bedrooms and a family bathroom. 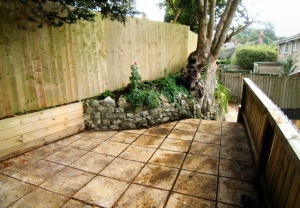 There is an enclosed rear garden with mature plants and walled residents� parking to the side. The village of Wroxall has a well stocked convenience store and pub. It is surrounded by beautiful countryside, views of which can be seen from the property. The property is available chain free. 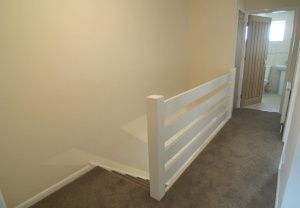 ENTRANCE HALL: 16� x 3�br />Doors to all downstairs rooms, radiator, stairs to first floor with under-stair cupboard. LIVING-DINING ROOM: 19�x 15�br />Open plan room with sliding patio doors to rear garden and further window to rear, archway to dining area and brand new white fitted kitchen. Radiator. KITCHEN: 13�x 8�br />Window to front. 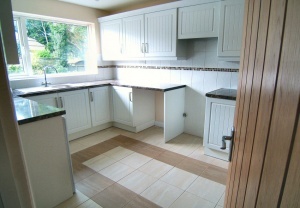 A brand new white fitted kitchen with a range of base and wall units with worktops over and tiled splash-backs. Stainless steel sink and drainer with mixer tap. Space, power and extractor for cooker, space and plumbing for washing machine, space and power for fridge-freezer. With frosted window to front, low level w.c. and corner wall mounted wash hand basin. 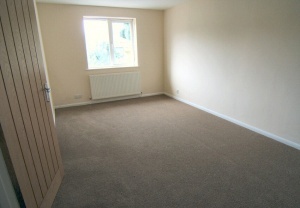 From landing, loft access and cupboard housing brand new gas combination boiler. 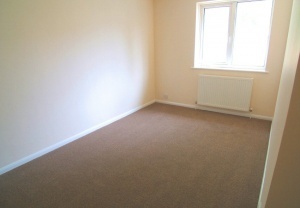 BEDROOM ONE: 16�x 9�br />Window to front with pretty views to the surrounding countryside. Radiator. 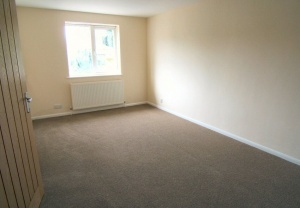 BEDROOM TWO: 13�x 7�br />Window to rear, enjoying views of the garden. Radiator. 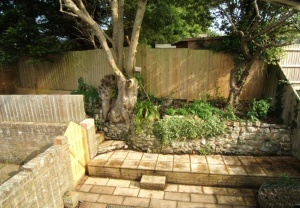 Window to rear, with views across the garden. Radiator. 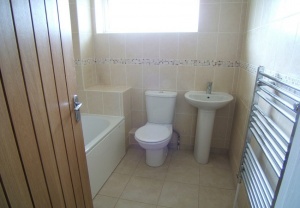 BATHROOM: 6�x 6�br />Brand new bathroom with window to front, tiled floor and walls. A white suite with panel bath and shower screen with shower attachment above, low level w.c., pedestal wash hand basin. Chrome ladder style heated towel rail. There are front and rear gardens with gated side access from front to back. The front garden is mainly lawn with some borders and to the back the garden is arranged as a large paved patio with steps up to the side offering a bonus extra terrace and space for small potting shed or greenhouse. 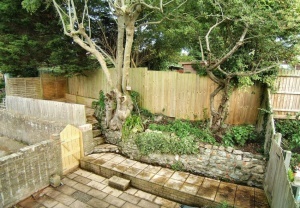 There is an attractive stone wall forming a raised bed with mature trees. 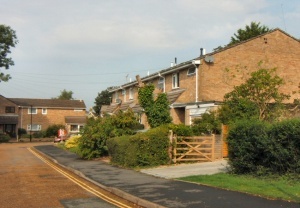 A back gate from the rear garden leads to a walled parking area which is allocated for residents� use.